The Dutch progressive rock act PBII is rather unique in the music scene. They not only come up with excellent music, which most of our readers can appreciate, they also at the same time come up with an important message. Following the socially involved projects Plastic Soup from 2010 (see review), which is all about the pollution of the ocean, and the prestigious musical 1000 Wishes (2013, see review), which is all about childhood cancer (KiKa), PBII now comes with the rock opera Rocket - The Dreams Of Wubbo Ockels. About our own planet earth! First a bit of a history lesson; Wubbo Johannes Ockels was a Dutch physicist, astronaut, pilot and professor. On October 30, 1985, he was the first Dutchman in space. Until his death in 2014, he was Professor of Aerospace for Sustainable Science and Technology at the TU Delft Faculty of Aerospace Engineering. Ockels died in 2014 of an aggressive form of kidney cancer. On his last day - and with his last breath - he spoke of our responsibilities. Save the earth, well now! Of course it wasn't easy for the band to come up with a successor for the very successful 1000 Wishes album. Guitarist Ronald Brautigam recalls: "For a long time, we had doubts about a topic for the new PBII rock opera. After the CDs Plastic Soup and the rock opera 1000 Wishes - with the topic of childhood cancer and KiKa as a backward goal - we were struggling to experience the conviction we felt on this subject again in a new theme. Until I was with my fellow band members and we talked about the last words of Wubbo Ockels. It grabbed me by the throat, and we had to do something about it, and so we did get in contact with the widow of Wubbo, Joos Ockels and their daughter Gean. They love it as it keeps Wubbo's dreams alive and they stand completely behind the initiative. Wubbo founded the Happy Energy organization in 2011 to positively inspire society into a more liveable world. After Wubbo's death, Joos has taken over his role with a lot of passion. But how to get such a serious subject transformed into a good musical concept and would it reach the same high musical level of its predecessor? After all 1000 Wishes was for me personally a true masterpiece. Well I could only discover this by locking myself inside my house for a couple of days. While outside the sun was shining and the temperature almost reached the 30 Degrees Celsius I was having a lot of listening sessions to get to know ROCKET-The Dreams Of Wubbo Ockels more and more. Each time I played it I heard new things. I just went on a very pleasant musical journey. Just like Wubbo out in space I noticed new things which gave me a lot of pleasure. The one complete hour of music grabbed me by the throat just as Ronald had been when he heard Wubbo's story. The twelve compositions are a real treat to listen to. Every single song is a feast for your ears. Sure the band harks back to their earlier rock opera. But that's not a problem. After all, that release contained only excellent music. Why not borrow some of those great musical ideas? Such as the use of violins and cellos. Well they of course did and this can be best heard on the three parts title track, or the soprano vocal parts of female singer Nathalie Mees. They can be heard almost throughout the entire album and are certainly a trademark in the bands current sound. But also her rock voice is worth listening to and adds something extra to the total sound of the band. Just listen to the track Happy Energy on which she provides the lead vocals in a perfect way. While mentioning one of the band members, obviously the spotlight must shine on the others as well. Because they were also responsible for the fact I could I could handle my days in solitary very well. Let's start with the rhythm section. Drummer Tom van der Meulen is the oldest member in the band but still acts like a young God behind his drum kit. Just listen for example to his up tempo parts in the second part of ROCKET Part 1 or on the jazz rock and fusion influenced piece Mother. A track on which bassist Alex van Elswijk also shows his talents all the way. Just like on the earlier mentioned Happy Energy on which he provides excellent fretless bass parts. But also his parts performed on the bass pedals are amazing. Just listen to the openings of Nothing Is Real and Blue Marble and you find yourself back into the seventies. It´s obvious that the spotlight is mostly on the soloists in the band and the man who does the lead vocals most of the time. Ruud Slakhorst has a great voice and his vocals resemble one of the best singers in the progressive rock scene. Namely former Yes vocalist Jon Anderson. It is just a must to hear Ruud sing. He isn´t afraid to give his microphone to somebody else to do the lead vocals as well. Like on the on the earlier mentioned Happy Energy or on Trapped on which they find Steve Hackett´s lead singer Nad Sylvan very willing to replace Slakhorst's original vocal lines. The most important members in the band are probably former Plackband musicians Michel van Wassem (keyboards, piano, backing vocals) and Ronald Brautigam (guitars). Their input can be heard on the entire album with excellent solo parts performed on the electric guitars and synthesizers. But also delicate parts performed on the piano and acoustic guitar can be enjoyed. But it is most of all Brautigam who shines when he delivers an amazing guitar solo. His parts are for me personally the highlights on the entire album. But I guess he couldn't be in the spotlight without the excellent musical parts done by all the others involved. Such as producer Chris Muller. Who made this album a very good sounding product. As for the songs on the album I can tell you that the main part of them move towards the sound which Yes released on their albums made in the eighties. But also influences could be coming from Supertramp as I heard on for instance Gravity. Also a band such as Toto came to mind several times. As can be spotted on the aforementioned Mother or the third part of the title track. But also the band they were before they renamed themselves to PBII can be heard several times. Just listen for example to the second part of the title track and you hear hints of the Plackband. What I most of all did find very attractive and most very cleverly done, is the way they put real progressive rock intro's and parts next to more commercial sounding parts. Parts which you can easily sing-a-long with. Don´t get me wrong these are real great compositions and can be loved by anybody who calls himself a proghead! Just listen to the complete ROCKET trilogy or Nothing Is Real or Blue Marble and you can´t deny they control it completely to mix both musical elements into great songs. On the entire album you can´t find any weak compositions and therefore you don´t have the urge to skip to the next track. As mentioned before each and every song separately is a feast for your ears. My complements go therefore out to the entire band and guest musicians for coming up with so much musical enjoyment during one whole hour of progressive rock music. But the question of course comes to mind is has the band has delivered with Rocket - The Dreams Of Wubbo Ockels another masterpiece as 1000 Wishes was all the way for me? While reading my review so far you probably have the answer already. I can give them honestly and whole hearted again the highest score possible and for myself they did it again. Another masterpiece was delivered by this great Dutch progressive rock act. 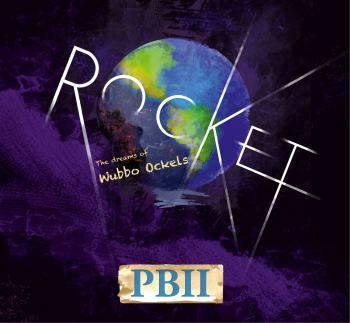 We here in the Netherlands can only be proud that in our country a band like PBII had the courage to release such a piece of art. Not thinking about selling millions of albums, which they hopefully will do, but going for a real artistic musical adventure and making only music they like themselves. Progressive rock in optima forma coming from the heart and played by a bunch of very talented musicians. Highly recommended to all lovers of progressive rock and without doubt one of the musical highlights of 2017!